Is There Such A Thing As Responsible Drug Usage? How Can I Find Free Methadone Clinics? Home › Methadone Maintenance Treatment Resources › How Much Methadone Will I Need? 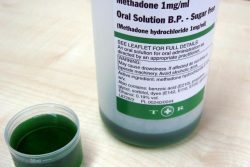 According to the National Library of Medicine, methadone “works to treat people who were addicted to opiate drugs by producing similar effects and preventing withdrawal symptoms in people who have stopped using these drugs.” The medication, when prescribed correctly, does not cause euphoria, blocks the effects of other opioid drugs, and is long-lasting enough to be taken only once a day. But how much of the medication will a specific person need in methadone maintenance treatment? According to the National Institute of Justice, “Dosage is determined by several factors related to the patient, such as opioid tolerance level, history of opioid use, age, and current medical status.” This is necessary because the situation of every patient is different, so it must be taken into account when the individual begins their treatment. Only a doctor can determine what amount of methadone is needed in order for it to be effective. There are two types of dosages for patients being treated with methadone: detoxification and maintenance. Usually, during detoxification the patient is given “an initial dose of 20-30 milligrams (mg).” This helps to suppress withdrawal symptoms but is considered to be a mild dosage amount. It is used when patients are being weaned off the medication, which could happen at the beginning of treatment if they are not receiving the full maintenance program, or it could be after they have been attending maintenance for a sufficient period of time and are ready to be weaned off the drug. For those who are being maintained on methadone, doses of 80-120 each day are usually used. This amount is “generally sufficient to prevent opioid symptoms for 24 hours, reduce cravings, and block the euphoric effects of opioids.” This is the optimum dosage amount, but some individuals may be given a different amount based on their needs. It is important that, if you have decided upon maintenance as your treatment program at this time, you find a clinic that will provide you with your own specified dose and that this dosage can be changed by your doctor if any issues occur. Though these are the recommended dosages for most patients, you will need to see a doctor at a methadone clinic before you can know which dosage is right for your recovery. The dose amount may change as you go through treatment, but it must always be a doctor who changes it, as methadone is a potentially harmful drug that has a high abuse rate. No one should attempt to guess at their dosage amount for methadone, nor should they try to change it without discussing it with a doctor. The drug is habit-forming, as stated by the NLM, and those who take it without a doctor’s prescription or take more of it than prescribed are abusing it and likely to become addicted. The amounts listed above provide a general guideline for most patients, but you will require a doctor’s prescription to know your specific dosage amount. Are You Looking for a Methadone Center? Call 800-530-0431 today. We can help you find a facility in your area so you can begin your recovery from opioid addiction.